Through joint action we will build the legend of gen. Maczek and his 1st Armoured Division! The Polish nation and the Polish country need a legend of a new hero, morally intact, devoted to God and Country, faithful to his sworn oaths and ready to sacrifice his life for the right cause, especially on the altar of protecting the independence of Poland. Above all, however, we Poles, after centuries of enslavement, tens of years of immense suffering and abasement, after years of constant failures and lost wars, we long to break free from the embrace of martyrological fetters, break through the level of graves constantly turned upside down, and break with the tradition of constant remembering and cultivating the position of a weak victim harmed by everyone. Giving due tribute to those who left and persisting in actions to bring back the memory and honor to stout-hearted, but defeated heroes, Poles – like earthworms waiting for the rain – wait for recalling from not a far past and being put before them a persona of a dauntless, victorious leader, adored by his soldiers, but also respected by the enemy, whose actions unquestioned by everyone will evoke our feeling of national pride, and will remind others of respect due to us. Entering a new era – we feel more and more that the process is already in the making – we need, and especially does the young generation, neglected educationally in the last years, such a historical, inspiring, wonderful person, preferably a knight of international fame – an idol. The obligation of those who know that since year 1935 Poland had only one (case of Władysław Anders fits a different category) soldier, who fulfils all the conditions necessary of persona of a legendary, undefeated leader – general Stanisław Maczek – is building His legend. 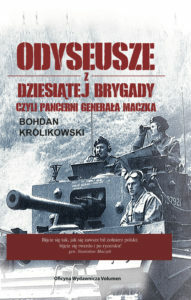 My talks with Maczek soldiers and fans of the General – soldiers, politicians, historians, members of social organizations, motor groups and many others – Poles, Frenchmen, Belgians and Dutchmen, Britons – do not leave any doubt, that together we will fulfill this honorable task.